Hodgkin's disease is reported especially in young age, suspected in the presence of suspicious lymphadenopathy. Its revelation by acute hepatitis remains very exceptional. 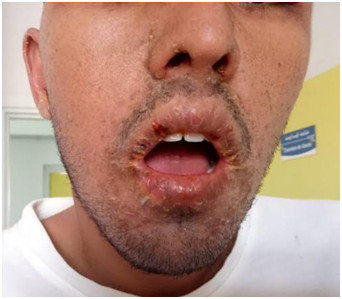 We report the case of a 25-year-old admitted in the emergency department for a febrile cholestatic jaundice, an erythroderma, an epistaxis with gingivorragias and edema of the lower limbs. Clinical examination revealed bilateral retroauricular and inguinal lymphadenopathy. The diagnosis of acute CMV hepatitis was based on the positivity of serology and Polymerase chain reaction “PCR”. Anatomopathological and immunohistochemical examination of lymphadenopathy confirmed the diagnosis of Hodgkin's disease. CMV hepatitis is not exceptional in an immunocompromised patient, what is exceptional in our observation is the fact that it has ushered an Hodgkin's disease. 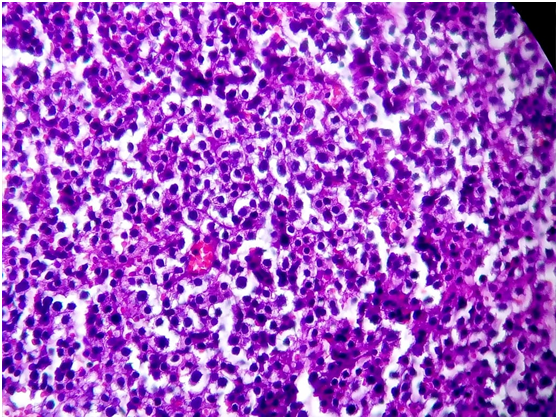 Hodgkin lymphoma (LH) is the first curable malignancy defined as a well-individualized anatomo-clinical entity that primarily affects B cells. Its diagnosis is based on the presence of dystrophic cells or Hodgkin-Reed-Sternberg cells (HRS). Revelation by acute hepatitis remains a very exceptional mode of discovery. It may be a secondary hepatic localization of the lymphoma or opportunistic hepatitis infection favored by lymphoma or its treatment. We report the case of a 25-year-old patient with acute CMV hepatitis revealing Hodgkin's disease. A 25-year-old patient, with a history of visceral leishmaniasis treated in 2014, and a nonsteroidal anti-inflammatory drug (NSAID) intake 24 hours before the onset of symptoms. Admitted to the emergency department for a cholestatic jaundice (dark urine, pale stools and pruritus) fever (39-40°C), associated with generalized erythema, gingivorragia, epistaxis and lower limbs edema in a context of severe asthenia, and anorexia. Clinical examination of the patient revealed: obvious mucocutaneous jaundice, rash, cheilitis, scales on the scalp, edema of the lower limbs, splenomegaly, multiple retro-auricular centimetric, mobile and painless lymphadenopathies, and several lenticular lymphadenopathy (Figure 1). An abdominal ultrasound and a complete liver blood test assessment are required first to eliminate a surgical (cholangitis), or medical (fulminant hepatitis) emergency. The ultrasound revealed hepatomegaly and splenomegaly. Lab results showed cytolytic hepatitis (with SGOT and SGPT at 12 times the normal levels) and a biological cholestasis (increase in GGT and ALP) and a prothrombin time to 53%. Figure 1 Un rash petechial rash, cheilitis. Ultrasonography of lymphadenopathy areas showed bilateral and multiple jugulo-carotid lymph nodes. An etiological evaluation is then performed: serologies of hepatitis A, B, C, E, CMV and EBV, a serology of leishmaniasis given the history of the patient associated to a myelogram, LDH and B2 microglobulin assay, and acid-fast stain in addition to Quantiferon- TB GOLD test due to the endemicity of tuberculosis in our country. Among the performed serologies, only CMV’serology was positive (IgM anti-CMV +), a CMV DNA assay by real-time PCR is then requested and returning very high. LDH were also very high (1000 IU / L). The diagnosis of acute CMV hepatitis is retained and treatment with Gancyclovir is started. The outcome was positive with clear clinical improvement (disappearance of the jaundice and desquamation of the cutaneous lesions) and biological (normalization of the liver blood test within 2 weeks). However, we noted an increase of the size of the lymph-nodes with persistence of asthenia. A biopsy is performed for the retro-auricular lymphadenopathy, and finally histopathological and immunohistochemical examination confirmed the diagnostic of nodular sclerosing Hodgkin's disease stage IV (Ann Arbor staging) (Figure 2). 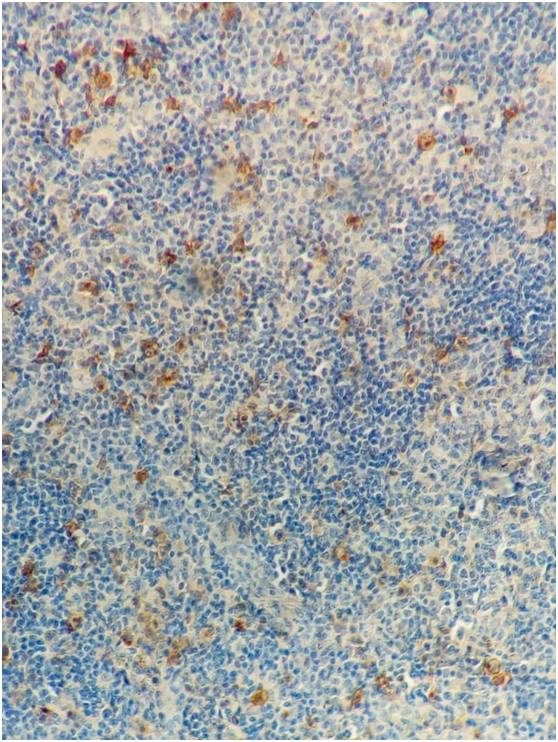 The tumor’s cells were expressing CD15, CD30 (Figure 3 & 4). The patient is then transferred to the hematology department for therapeutic management. 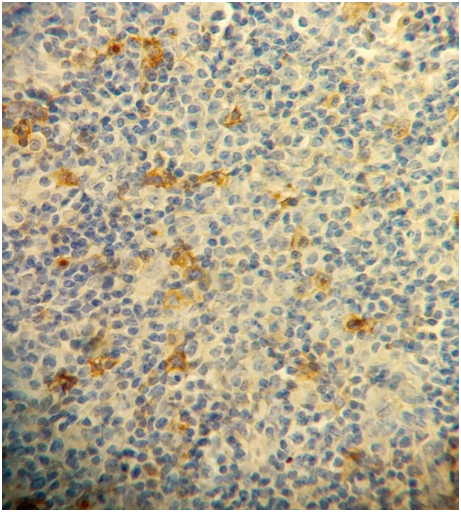 Our patient presented an acute CMV hepatitis leading to the discovery of Hodgkin's disease. The rarity of these two conditions, their concomitant evolution and the negativity of the rest of the etiological assessment suggests the diagnosis of liver affection favored by the immunocompromised state that inaugurates this hemopathy. Hepatic infiltration by lymph node or extra-ganglionic lymphoma is observed in 5 to 20% of non-Hodgkin's lymphomas B or T classified according to the WHO classification,1 because the liver is the viscera most commonly affected after hematogenous diffusion at the bone marrow and spleen; hepatic lymphoma is then called "secondary" stage IV according to the Ann Arbor staging. On the other hand, patients with hematological disease with or without treatment are at high risk of opportunistic infections (pneumococcal infections, herpes virus, cytomegalovirus, tuberculosis, toxoplasmosis, cryptococcus, aspergillosis, etc.). In immunocompromised patients, CMV infection is more frequent and often more severe, associating pneumonia, hepatitis, retinitis, gastrointestinal involvement and encephalitis. CMV hepatitis in an immunocompromised patient is not exceptional, what is exceptional in our case report is the fact that it has ushered in Hodgkin's disease. Jaffe ES, Harris NL, Stein H, et al. (Eds. ), World Health Organization Classification of Tumours Pathology and Genetics of Tumours of Haematopoietic and Lymphoid Tissues. Lyon : IARC Press, 2001. Just-Nubling G, Korn S, Ludwig B, et al. Primary cytomegalovirus infection in an outpatient setting-laboratory markers and clinical aspects. Infection. 2003;31(5):318–323. Bentata-Pessayre M, Beaugrand M, Callard P, et al. Granulomatous hepatitis in cytomegalovirus infection in healthy adults. Ann Med Interne (Paris). 1987;138(5):353–357. Kunno A, Abe M, Yamada M, et al. Clinical and histological features of cytomegalovirus hepatitis in previously healthy adults. Liver. 1997;17(3):129–132. Serna-Higuera C, Gonzalez-Garcia M, Milicua JM, et al. Acute cholestatic hepatitis by cytomegalovirus in an immunocompetent patient resolved with ganciclovir. J Clin Gastroenterol. 1999;29(3):276–277. Foti G, Hyeraci M, Kunkar A, et al. Cytomegalovirus infection in the adult. Minerva Med. 2002 ;93():109–114. WF Hooi, A Malhotra, J Pollard. Cytomegalovirus associated longitudinally extensive transverse myelitis and acute hepatitis in an immunocompetent adult. J Clin Neurosci. 2018;50:152–154. ©2019 Elhidaoui et al. This is an open access article distributed under the terms of the Creative Commons Attribution License , which permits unrestricted use, distribution, and build upon your work non-commercially.